I didn’t realize that I liked beer until I actually tasted some that had flavor. It was a lovely experience – I guess I kind of liken it to tasting really good chocolate. So as you may guess living in Fort Collins, a microbrew mecca, has been a pretty enjoyable experience. There are lots of new, flavorful beers available to taste, tours to take and beer festivals to attend. 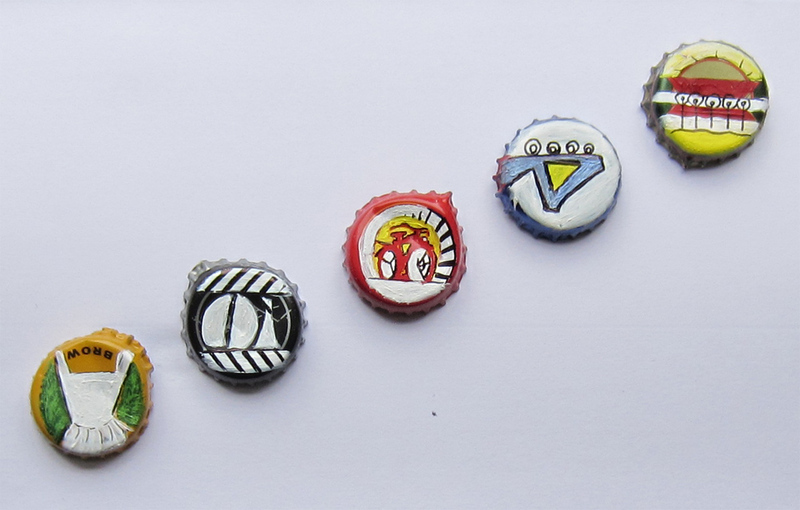 We’ve been collecting bottle caps for a few of our friends who plan to adorn themselves with bottle cap clothing for one festival. Yesterday I stole from the stash in order to create day 20’s piece. I used the cap’s original design to guide my direction. Similar to day 13’s project, I aimed to keep the mini art simple and colorful. While I like the caps grouped, I plan to present each as individual works.